« What Do You Need to Know About Distracted Driving Laws? Keep yourself safe by having a fully-stocked emergency kit in your truck. Whether you are new to the trucking industry or are a seasoned veteran, you should always keep a well-stocked emergency kit in your truck. 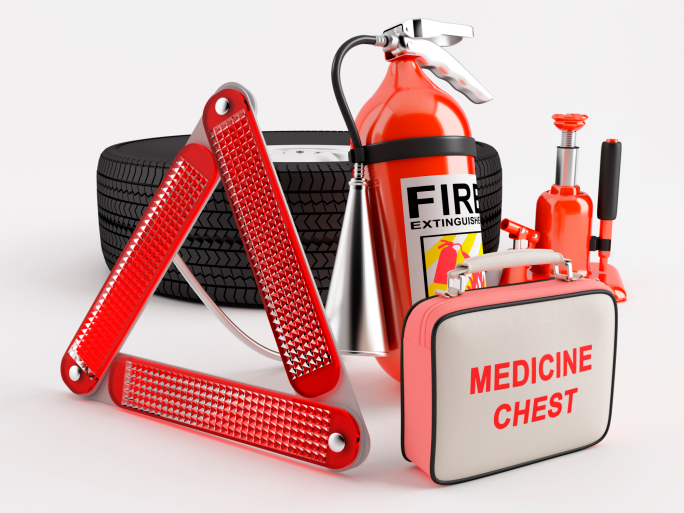 If you ever find yourself in an emergency situation, an emergency kit can help you to diffuse the situation and get you back onto the road faster. Here’s a basic list of what supplies you should make sure to have before setting out on the road. Fire extinguisher. Whether you have a fire on your interior upholstery or an engine fire, a fire extinguisher can save you from the potential of losing your truck before the firemen can arrive. First Aid Kit. A first aid kit is essential in cases of injury on the road. If you take any medications or have any allergies, make sure to always include your necessary medications in your first aid kit before setting out. Flares are helpful for alerting other vehicles of your position when your truck breaks down. You can help to avert an accident by lighting flares when visibility is difficult. Extra tire and jack. Most of us have to deal with a flat tire at some point. You can save a lot of time if you already have the equipment to replace your tire on hand. Water, energy bars, and extra clothes. Hopefully you’ll never have a need for these, but in the occasion that you get lost in an area that is not densely populated, you’ll be glad that you had these precautions packed ahead of time. Keeping energy bars in your glove compartment can also serve as a good snack to keep your blood sugar up before you make a pit stop. A flashlight is always a useful tool for many jobs that you may need to do in the dark. Make sure to also keep extra batteries just in case you use up the ones that are already in your flashlight. Kitty litter or sand, a window scraper, and a shovel. These supplies are necessary if you are planning on doing winter You can waste a lot of time if your truck gets stuck and you can’t get it out. Kitty litter or sand provides necessary traction, and a window scraper ensures that you will have the necessary visibility you need when it’s snowing. This entry was posted on Friday, December 18th, 2015	at 9:58 pm	and is filed under Blog	. You can follow any responses to this entry through the RSS 2.0	feed. Both comments and pings are currently closed.